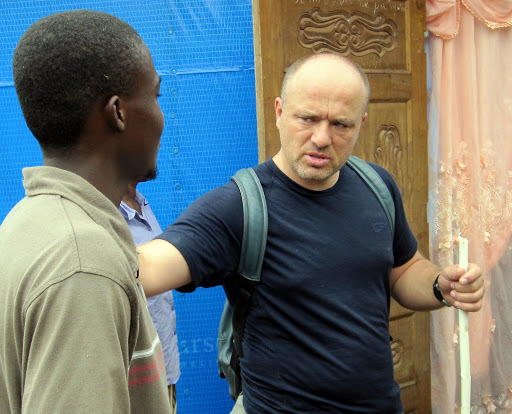 We had a group from the Czech Republic come to Haiti this week to assess how churches in Czech could help with the crisis recovery efforts that TouchGlobal is doing here. Daniel is the leader of the Czech missions sending agency ZMA. He and the others saw the vast range of opportunities here to show the love of Christ with works of compassion. In this photo Daniel is communicating with a Haitian who is showing him his new home that TouchGlobal built. 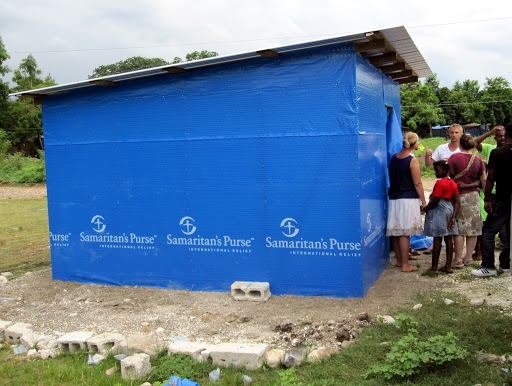 These homes, designed and resourced from Samaritan’s Purse, are being built throughout the earthquake impacted areas of Haiti. People are now able to move from tents into structures that can hold six people, survive a Category 2 hurricane, and last 1-3 years. 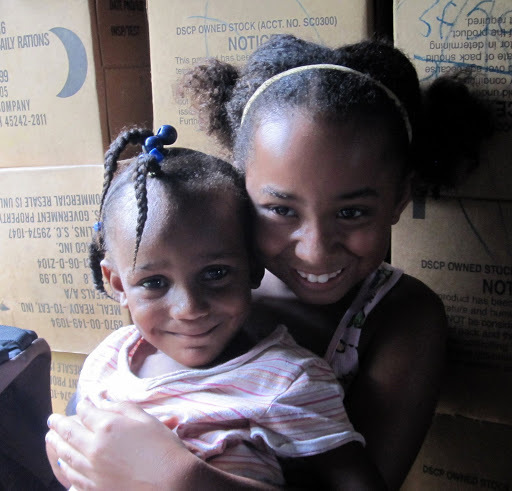 We are excited by the interest that churches in many countries have shown in partnering with us to help Haiti. What a witness for the Gospel when people of many cultures come together under one banner to give with no strings attached. "I said A Boom Chicka Boom!" Today Anna was with me as Cathi was off in another area of ministry. We took a team to an orphanage that we’re helping and Anna became a pied-piper for little girls….walking up and down this wood platform, trying to keep them out of the mud. It was such a pleasure to listen to her leading them in a chant (in English) as they repeated the sounds and followed her up and down grinning from ear to ear. An ordinary workday turned celebration for Anna’s 10th Birthday! After a special pancake breakfast (Anna’s had chocolate chips), while Brian headed out with the international team here to capture a glimpse of ministry opportunities here in Haiti, the rest of us headed to our respective work sites– Brian and Byron to an orphanage where they were constructing a building; Dave, Cathy, and Lori to roof shelters in a nearby neighborhood about a kilometer down the road from the base/TG operations center, the Haitian Queen. I was riding along with them as Steve and I would be accompanied by Miguel, our translator so as to obtain GPS coordinates for recently completed shelters, meet the homeowners, and pray a blessing over their new home so the moving in process could begin! Lunchtime back at the base, but raindrops turned into pelting sheets of rain as we headed to the worksite in Gressier to obtain tools left in anticipation of the afternoon’s work–tomorrow would come soon enough, and work would resume. 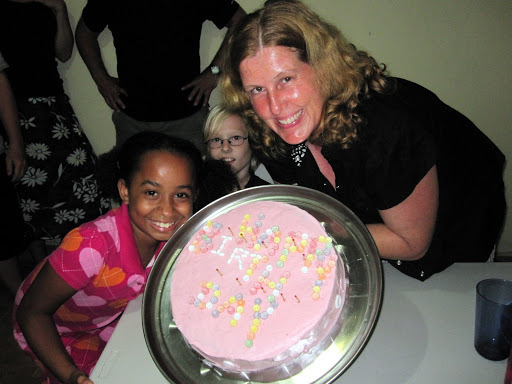 Preparations for celebrating Anna’s 10th birthday could be done in a more relaxed manner–new Haitian friends and EFCA missionary applicants (and their 3 kiddos) visiting family in Christianville will be joining us for the celebration. I wonder if Anna is still working out the details of her latest birthday request? She decided instead of a Barbie dreamhouse, she’d love a younger sister….and the others were headed to the orphanage again. Maybe tickets to a Jonas Brothers concert in Costa Rica aren’t such an expensive proposition? 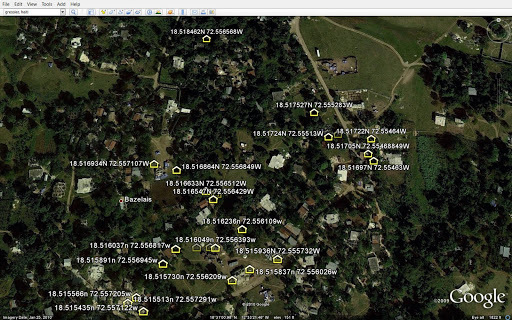 Much of the world’s focus has drifted from the devastating images from January 12, 2010, when a 7.0 earthquake leveled buildings in Port-au-Prince and surrounding areas. As our airplane touched the tarmac, my husband marveled at the empty fields that had been occupied by major humanitarian agencies just weeks before. Passengers were still transported to an outlying warehouse for immigration and baggage claim, and I found myself reliving scenes from my past in other third world countries, wondering what my next week serving in Haiti with Reachglobal/Touchglobal would look like. Throngs of people speaking a mix of French and Haitian Creole (neither of which sounded familiar now that I’ve lived in Costa Rica for two years), individuals offering their cell phones for a fee, taxi drivers, and vendors hawking food and drink crowded outside the chain link fence which separated the newly arriving passengers from that chaos. My stomach churned as we realized that our neon green-shirted Touchglobal driver was nowhere in sight, and that a wait would include time in the tropical sun with two large duffel bags, assorted carry-on pieces, and Anna, our soon to be ten- year-old daughter. My mind recalled a similar situation twenty years ago in Quetta, Pakistan, and I relaxed. God had brought me through situations there I wasn’t ready for with our infant son in tow, and He would be with us during the week ahead in Haiti. Crumbled buildings, mangled autos burnt beyond identification, shells of businesses long since vacated or demolished remained, as did hopeless faces. Tents, temporary shelters, and newly erected tarps and organization-branded, Tyvek -wrapped structures dotted the dusty, rutted road to Gressier. 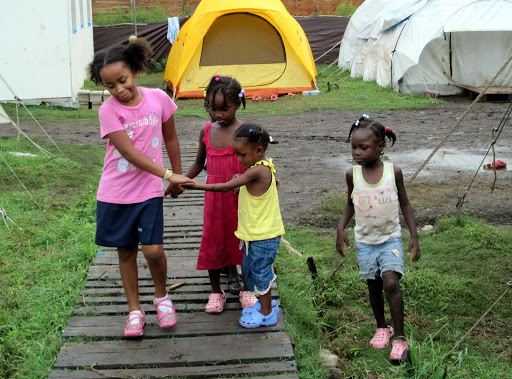 Poverty marked indelibly by a major earthquake remains, but Sunday would dawn with a different sound—the sound of praises sung at sunrise, and a worship service with over one hundred smiling Haitians, the joy of Christ evident on their faces, dressed in their Sunday best(be it well worn, torn or stained from lack of adequate shelter)worshipping in an outdoor sanctuary without walls, shaded by a canopy of green trees, cooled by a gentle breeze, partaking in communion with one another and white-faced “blancs” from a myriad of countries. God is at work in Haiti. Are you willing to step out of your comfort zone?